Update: 4/10 Beatrix is now in kennels with us and what a gorgeous girl she is. 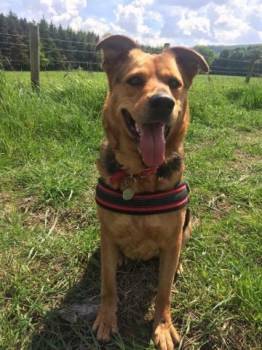 This 4-year-old GSD X Rottweiler is urgently looking for a new home due to an incident with another dog (which wasn't her fault) and owner now feeling nervous about keeping her. Beatrix is a strong and energetic girl so will need an active home, she will happily be out for hours with you. Our volunteer was greeted very well by Beatrix and found her to be a happy and friendly girl who obviously loves the company of humans and we are told she is normally fine around other dogs she meets. Beatrix isn't known around young children so an older teenage home would be fine. As Beatrix is such a loving girl it might be best to find a home where someone is around to give her the company she craves though again she can be left in the current home for a couple of hours or more. Beatrix will be a super doggie companion for anyone looking for a cuddle monster!